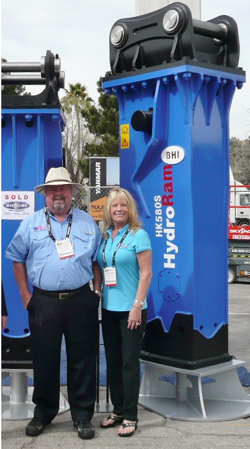 Ron and Sheri Johnson of RJ Hydraulic Hammers and Heavy Parts continue their periodic travels throughout the United States interviewing for select dealers for the BHI HydroRam brand line of Hydraulic Hammers and Attachments. So far, travels have taken them to Louisiana, Texas, Oklahoma, Arkansas, Illinois and Ohio. They hope to have the opportunity to meet with interested potential dealers. Please call Ron direct at 727-215-4924 if you are interested in learning about this exciting new dealer opportunity.